One of the biggest problems right now is what to do with all our photos. Taking them is easier than ever. So is sharing them. But storing and organizing them all in different places still manages to be an experience filled with gotchas, and one that varies wildly depending on what companies you’ve sworn allegiance to with your phone and computer. And if that company’s been Apple, you’ve basically been a guinea pig in a good idea that was hastily (and poorly) executed. 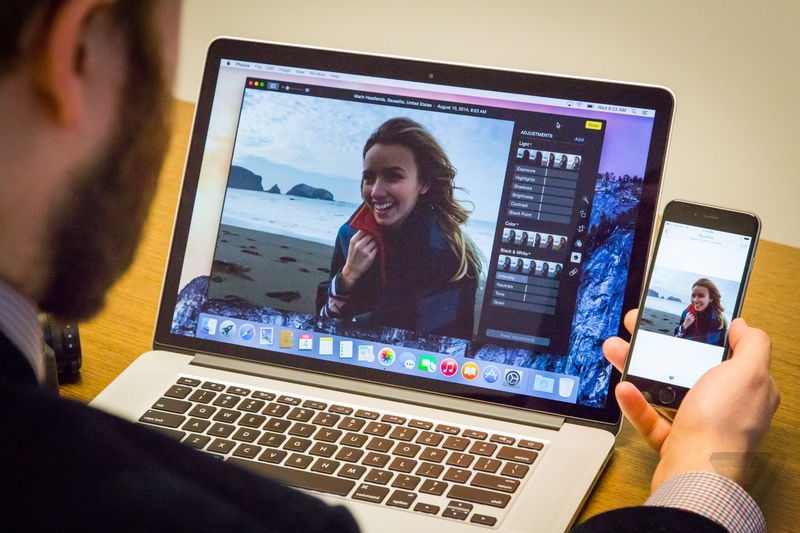 Apple might have just fixed that for Mac users with the new Photos app. It’s the final piece in a plan that Apple unveiled last June, and one that both fixes and unifies a patchwork system it rolled out in 2011. It’s a rethink of how people manage their photo library on a Mac, something that’s been iPhoto’s home turf for more than a decade. Apple’s discontinuing that software along with Aperture (which is aimed at pro photographers), in favor bringing the tools people have on their iPhones and iPads to the Mac. It’s also been built with Apple’s iCloud in mind instead of an afterthought, which feels years overdue. You should probably use the iCloud Photo Library feature, which syncs all your photos across all your devices — but you’ll almost certainly need to buy more iCloud Drive storage to take advantage of it. Everything you shoot with your iPhone or import into the new Photos app is backed up to your iCloud Drive and shared seamlessly across your devices. Using it is a pretty great experience. If you don’t want to try iCloud Photo Library, you can keep using the new Photos app as an iPhoto replacement, but you’ll be stuck with the old My Photo Stream feature (and its odd restrictions) for syncing photos across your devices. As simple as Photos is, the devil is in the details, and there are quite a few details here. Familiar features have moved or changed, and in classic Apple fashion, some have also been quietly removed. We’ve spent some time with a pre-release version of the software to highlight some things you should be aware of. If you’ve been using the iCloud Photo Library beta for iOS 8, you’ll be pretty familiar with how Photos for OS X works. Rather than the old “My Photo Stream” feature, which pushed 1,000 photos (or 30 days worth of photos) across your Mac and iOS devices, everything you shoot on your iPhone will automatically get uploaded to your iCloud Drive. When you open up Photos on your Mac, you’ll see everything you shot in a view that’s nearly identical to what you see in iOS — all your photos are organized by date and location. 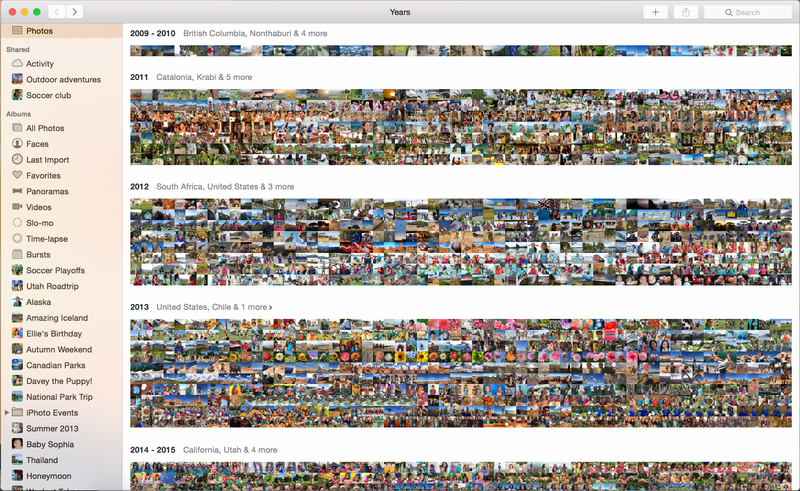 You can zoom out to a year overview or zoom in and see any particular photo. Apple’s also included the see-every-photo-as-a-microscopic-thumbnail view to navigate several hundred photos at a time. What is probably most noteworthy about the new app is that Apple is no longer simply using iCloud to share your photos across devices — if you choose, you can now store every image you shoot on your iPhone in your iCloud Drive. To help make this work without taking up a ton of storage, Apple is also giving users the option to optimize storage on their devices. Instead of locally storing every image in full resolution, you can opt to have the full images live in iCloud; smaller, optimized images that take up much less storage space will instead be displayed on your mobile devices and even on your Mac. At any time, you can choose to download the full-size image if you’re so inclined. Of course, if you buy into this setup, you’ll be trusting Apple to keep all the originals safe in iCloud. Fortunately, you can set it up so that the Photos app on your Mac keeps all the original, full-size images stored locally if you so choose. You’re still free to choose the optimized setting on your iOS devices to save space there. If you’re a photographer who shoots with a standalone digital camera, Photos will happily import both JPG and RAW files and treat them much like the photos you shoot on an iPhone. If you have Photos set to upload everything to iCloud, it’ll store the original, full-size images in the cloud and sync them across your devices. It’s worth noting that Photos for OS X obfuscates the file system even more than iPhoto or Aperture do — once you import photos from your camera, it seems to be impossible to locate the original file in the Finder, even if you have Photos set to store the original, full-size images on your computer rather than only keep them in iCloud. Those who want to maintain absolute control over their images will probably want to save original files in Finder and then import the best shots into Photos for further work and sharing. Beyond simply providing a much better way of organizing your photos across multiple devices, the new Photos app for OS X does much of what its predecessor did — you can make a wide variety of edits (more on this later), create calendars and books, use face detection to sort photos by the people that are in them, share them with iCloud or across some third-party services, and more. Nearly every feature included in iPhoto is present here in Photos, and Apple has finally fixed its confusing cloud-syncing solutions in favor of something much simpler and smarter. Is this better than iPhoto or Aperture? It really depends on how you were using those two apps. This is eminently more lightweight than either of those two, and more familiar to iOS. You basically get the same set of filters, controls, and effects you’ll find on iOS, and everything gets synced up the second it’s done. Also, the photos you have stored in iCloud Drive no longer feel tacked on the way Photostream did in iPhoto and Aperture. THIS ISN’T AN APERTURE REPLACEMENT Now, if you were one of the people who loved Aperture because you like adjusting every possible little setting, and having things like a loupe for pixel-peeping, adjustment brushes for fixing dust spots or blown highlights, and plug-ins to add extra features, here’s some bad news: none of these things are present in Photos. 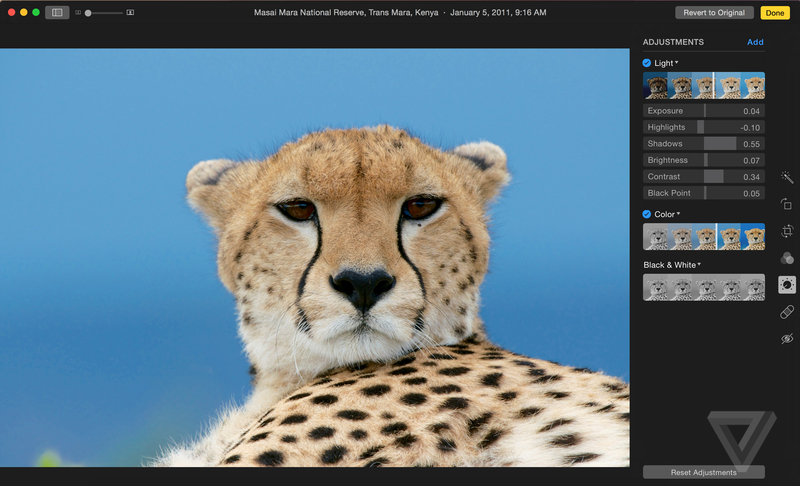 Dedicated iPhoto users should find plenty to like about the new OS X Photos app, though. For more details on this, see our in-depth preview. As mentioned before, this is a completely new app with changes to both its look and feel, and how you edit photos. But there are a few new features. If you’re an iPhone or iPad shooter, there’s now a way to sort between specialty photos and videos from Apple’s newer devices. That includes things like panoramics, burst shots, slow motion, and timelapse video. This is basically the same thing you can do on iOS, now on Mac. Apple’s changed up its shared Photo Stream section to look less like albums, and more of a running activity log — just like it does on iOS. The big difference here is that any shared albums you have with friends show up in the main source list instead of hidden away within the app. A new auto-crop tool that looks at your photo to figure out where the horizon is, then adjusts it according to the rule of thirds. A new zoomed out view for collections and years that makes thumbnails absolutely tiny. You can see what pictures are by clicking and scrubbing, just like how it works on iOS. New square book formats if you’re printing photos through Apple. Pretty much everything that is in iPhoto can be found in Photos, but some things did not make the cut. It’s worth noting we were using an early build of the software, and things could be added both in the public release and shortly after. The long-running star rating system has given way to favoriting photos with hearts, though existing star ratings are preserved from your old photos and accessible through search. 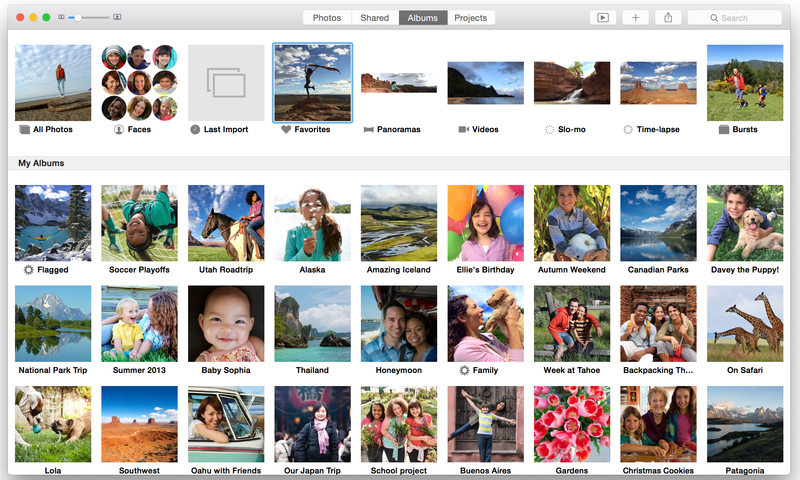 iPhoto’s odd built-in mail tool is also gone, and has been replaced with kicking photos out to Yosemite’s Mail app. That’s an extra thing to have set up outside of Photos, but on the plus side it means that those messages will actually show up in your sent folder instead of into the ether of Apple’s internet as they did before. The syncing tools for Flickr and Facebook, which let you set up an album to automatically post to either of those places, is gone. 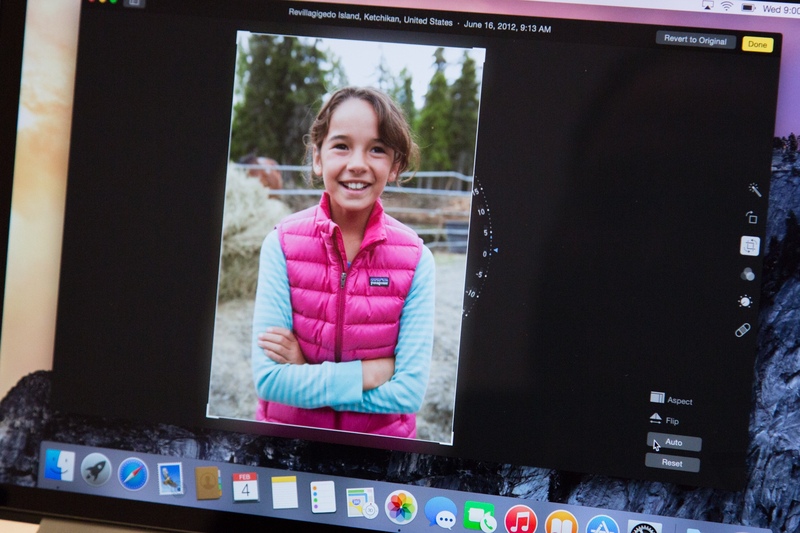 That’s been replaced with Apple’s system-wide sharing tools, which means a little more legwork is required if you’re relying on iPhoto for keeping online albums up to date. You cannot geotag photos, though you can see, sort, and search by where photos were taken. Editing and color correction tools for photos on your videos, that’s still iMovie’s territory; you can’t even trim a video that’s stored in your library without jumping out to another app. How does this handle storing photos on my Mac versus iCloud Photo Library? Either you keep everything on your Mac, or sync up everything in your Photos library with your iCloud Photo Library. That means no selecting certain photos of events to sync up. Power users might hate that, but the feature’s been designed so you don’t have to remember to flag items — something that’s tedious with larger libraries. It’s worth noting that even if you choose to sync your photos with iCloud Photo Library, you can still keep the original files stored locally on your Mac while having your library mirrored across multiple devices. Do I need to buy iCloud Drive storage now? Photos can be used without iCloud Photo Library, and thus your iCloud Drive storage. You can keep both photos and videos in the Photos app, just like you could with iPhoto and Aperture. You can also keep using iCloud’s Photo Stream feature, though it does not store full quality versions of your photos. Once you’ve upgraded to iCloud Photo Library, Photo Stream as we’ve known it is replaced by All Photos. If you do want to flip on iCloud Photo Library, Photos provides an estimation of how much storage it will take. If that goes over the free amount you have from Apple, you can subscribe to one of its various storage tiers, just like you can from iOS devices. Apple gives you 5GB for free, but keep in mind that you’re also sharing that space with things like iCloud backups, as well as any other files you have stored in iCloud Drive. Photos you’ve taken on your iPhone count separately from those backups, but can eat into that space quickly. Apple Photos won’t make this worse if you’re just snapping shots with your iPhone or iPad, but it definitely will if you plan to store RAW photos from a DSLR. THAT FREE 5GB DISAPPEARS QUICKLY Currently, Apple offers four different tiers of extra iCloud storage, which have varying costs depending on what country you’re in. In the US, at least, it’s 99 cents a month for 20GB, $3.99 a month for 200GB, $9.99 a month for 500GB, and $19.99 a month to jump to 1TB. What’s happening to iPhoto and Aperture? Both pieces of software will live on, for now, though are no longer being developed by Apple. Photos is the new iPhoto, basically, so your library is transferred over. Aperture users, however, can continue to use Aperture if they want to make more advanced edits. But those edits made in Aperture won’t sync over to Photos and vice versa. Do I need to do anything to my photo library on iOS, iPhoto, or Aperture? No. Apple will let you move your iPhoto or Aperture library into Photos and preserve your edits. However, because Apple changed some of its organizational tools, some things do get lost or changed in translation from an iPhoto or Aperture library. Star ratings get turned into hearts (or favorites), and projects are turned into albums. Other metadata is retained but will only show up in search. You need to search for things like color labels and flags. Also, if you’ve added custom metadata fields to any photos in Aperture, those fields do not carry over. For iOS users, there’s nothing to do. If you’ve turned on iCloud Photo Library, all your photos and albums will show up in Photos. This all sounds really complicated, can I just use something else? On the Mac? Of course. The same thing goes with your iPhone or iPad. Pretty much every company now, including Amazon, Box, Dropbox, Google, Flickr, and Microsoft have apps that will perfectly and seamlessly sync your camera roll to their servers. The key reason to use this is if you’re the kind of person who does not want to deal with setting up another service, and both likes and wants to use Apple’s tools. Casey Newton contributed to this report. Microsoft is planning to release Office 2016 later this year, but it’s letting anyone test a preview copy a little early. Over at Microsoft’s Connect site you can simply sign-up and acknowledge a non-disclosure agreement to get access to the Office 2016 bits. There’s not a huge amount of new changes from Office 2013, but the next version does include adarker theme and Clippy-like helper. While Microsoft is also making various other UI tweaks and feature additions, the overall look and feel of Office 2016 will look very similar to Office 2013. Microsoft recently started previewing its touch-optimized versions of Office for Windows 10. The new touch apps are impressively fast, and include basic editing features that are perfect even for mouse and keyboard users. Both Office 2016 and Office for Windows 10 will ship later this year.